CapoVelo.com | What is Artistic Cycling? CapoVelo.com - | What is Artistic Cycling? 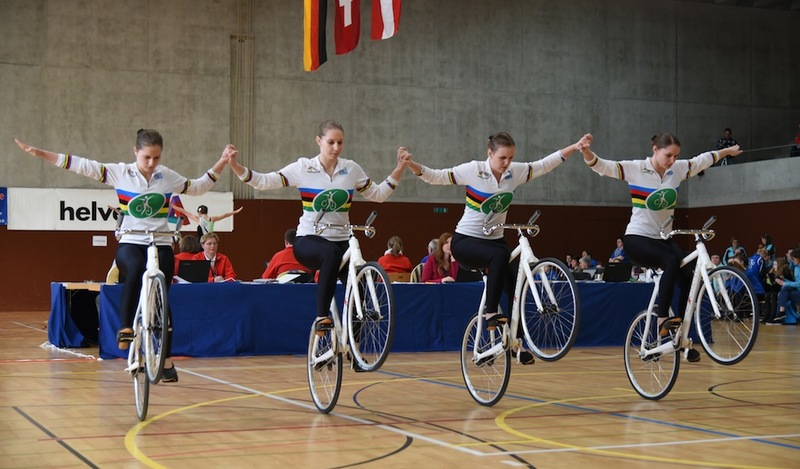 Artistic cycling is a form of competitive indoor cycling in which athletes perform tricks (called exercises) for points on specialized, fixed-gear bikes in a format similar to ballet or gymnastics. The exercises are performed in front of judges in five-minute rounds by singles, pairs, four- or six-man teams. The first unofficial world championship in artistic cycling was held in 1888 by Swiss-American Nicholas Edward Kaufmann and was largely a publicity stunt to showcase his trick bicycling. The first official world championships were held for men in 1956 and for women in 1970. The type of bicycles used for artistic cycling are a form of fixed gear bicycle. The gearing of the chainring and sprocket are run at or near a one-to-one ratio, but the chainring may not have fewer teeth than the sprocket. The wheels must be of equal size and are closely spaced in order to make tricks, such as wheelies, easier to perform. The handlebars are similar in form to a shallow drop handlebar found on a traditional road racing bicycle which has been turned upside down. Handlegrips or bar tape are applied to the top, horizontal portions of the bar. The handlebar, which can spin 360°, is mounted to a stem that has no horizontal extension, which puts the stem clamp in line with the steering axis and allows for the handlebars to remain in the same relative position no matter whether the front wheel is facing forward or backward, along with crankarms that measure between 130 to 170mm center to center. The riding area for artistic cycling is a wooden court, which also serves cycle ball competitions, that ranges in dimensions from 9 x 12 meters to 11 x 14 meters, where the maximum size is mandated for international competitions. Three concentric circles are taped or painted at the center of the court with diameters (measured to the outside edge of the line) of 0.5, 4, & 8 meters. Four half-meter hashes extend radially from the four quadrants of the middle circle. A clear area of 0.5 to 2 meters must be free of all immovable objects around the perimeter of the court. Two meters is required for international competitions. 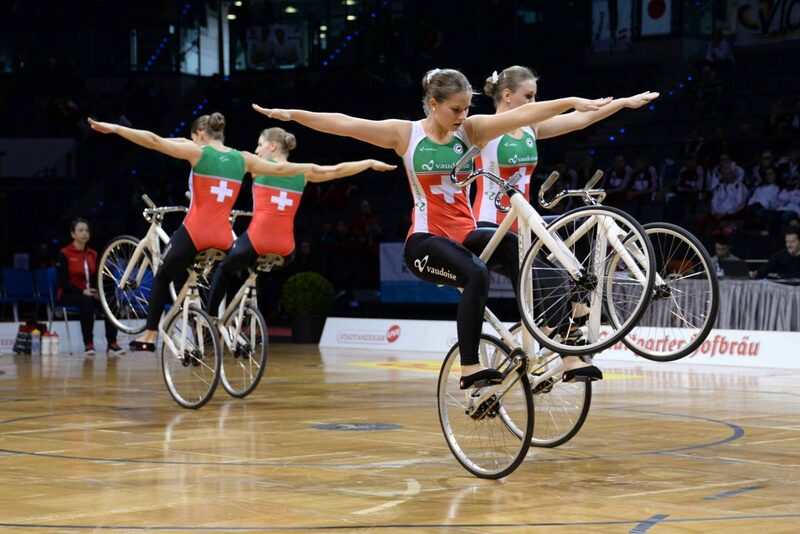 Artistic cycling routines can be performed in singles, in pairs, or four or six member teams. Each routine lasts for five minutes and riders perform as many moves as possible within the allocated time. Competitions are conducted in a format similar to that of gymnastics in which each routine performed is judged by a panel of judges. Each routine is scored based on several factors, like degree of difficulty of the moves performed and execution, and are awarded points. Teams are also deducted points for failure to complete certain moves. The individual or team with the most number of points at the end wins the competition. 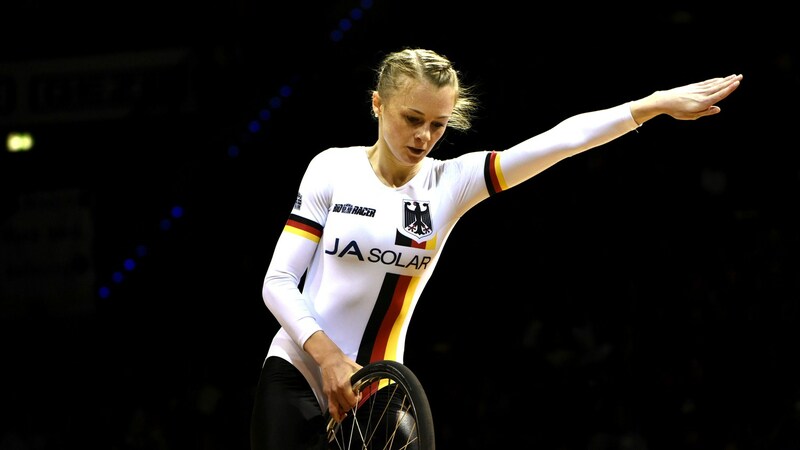 The highest level competition conducted for the sport is at the UCI Indoor Cycling World Championships.